After a long and dark winter if finally felt like spring this weekend. But don’t be fooled by the pictures it is still freezing cold. Which is why I decided to add some layering pieces to my wardrobe. I am one of these people that constantly feel cold and only survive winter with lots of layering. 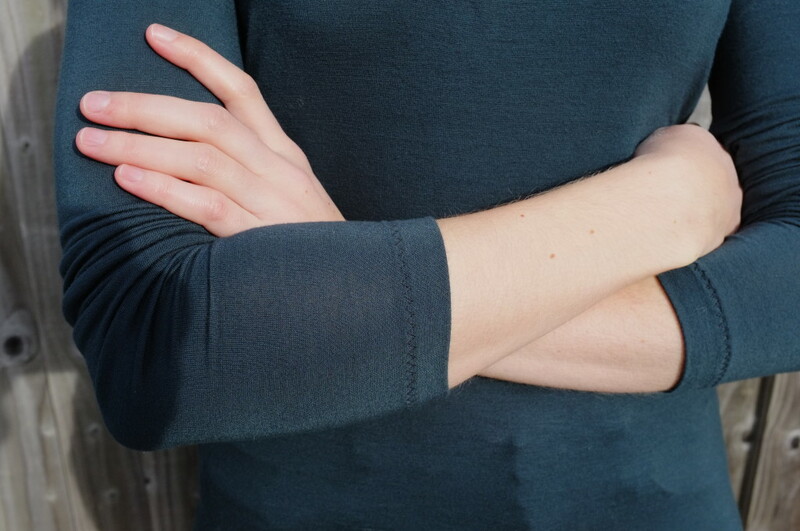 While I have a wide range of tanks that I wear under my clothes, I was basically wearing the same ready-to-wear longsleeve every single day. Something needed to change and since I am the proud owner of an overlock since last October I decided to make something myself. I got some grey marl jersey from Fabric Godmother and some dark teal jersey from Goldhawk Road. From the grey fabric I made the Papercut Patterns Fall Turtleneck. I’ve always had a thing for turtlenecks. Actually one of my first shopping experiences that I remember, was when I bought an orange turtleneck and black trousers with my grandmother. I had this exact combo in mind before we got to the shops and for some reason thought it would be a cool outfit (I must have been around 13 at the time, don’t ask me where I got my fashion ideas from). I’ve had a couple more turtlenecks throughout high school but at some point they disappeared from my wardrobe and it wasn’t until recently that I felt the need to add one to my wardrobe again. This need was definitely fuelled by seeing them pop up everywhere in the shops and in the online sewing community. 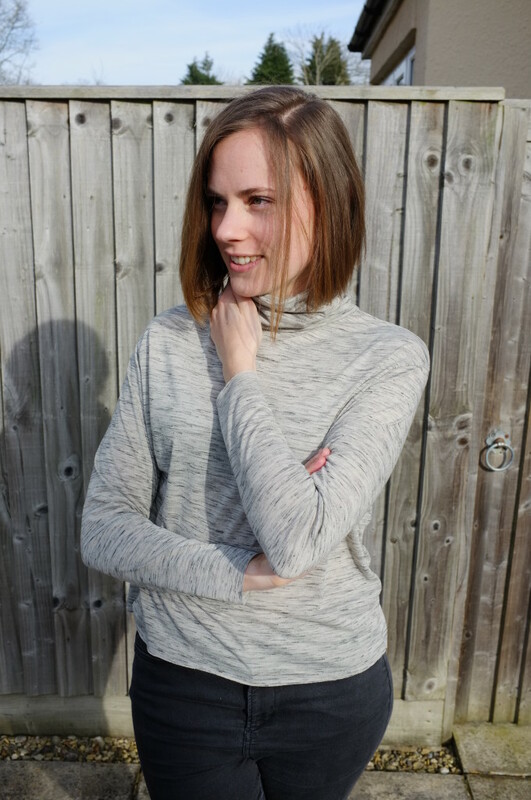 When I first saw the pattern for the Rise and Fall Turtleneck I registered it, but wasn’t really drawn to the loose silhouette and the dropped shoulders of the version on the cover. But after seeing cool versions online I decided to go for it. The pattern does actually include a more fitted version but in the end I decided to try the looser shape to see if I liked it. 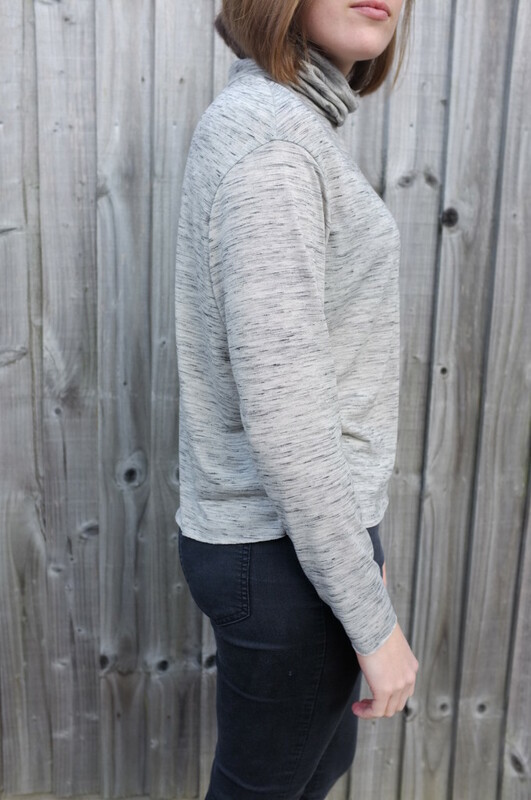 I am currently trying out shapes that I would not normally gravitate towards, so far with limited success (I’m looking at you Inari Tee Dress!). 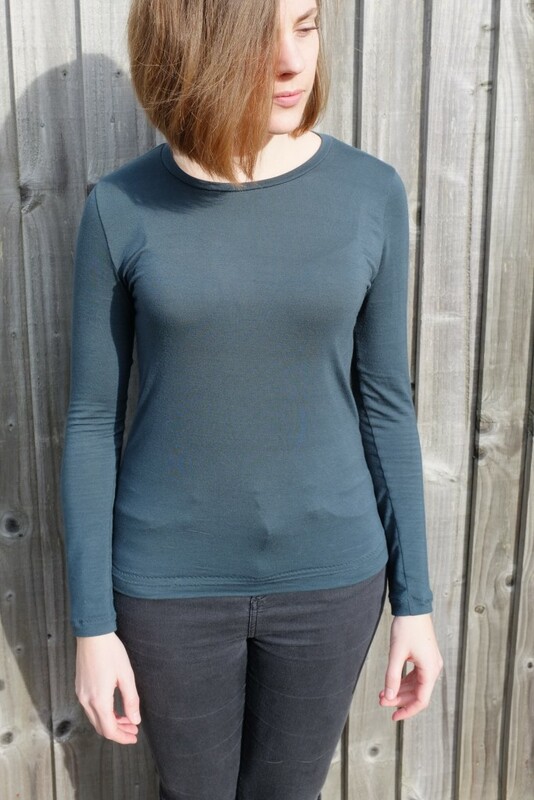 I cut a size S and assembled it quickly on my overlock (how I love the speediness of working with such a machine!). Overall I am quite happy with the fit, especially around the shoulders. It is quite roomy overall but that was to be expected. The main issue however is the length of the sleeves and the body. I already suspected that when I cut out the pieces but wanted to see how the slightly cropped length looked. In the end I decided to leave the hems unfinished as the length is just about enough. I contemplated adding cuffs but in the end I am ok with leaving them as they are. While I do feel slightly like an old man with this turtleneck (I think it’s the grey together with the looseness) it feels nice to wear and is perfect for wearing at home when I don’t want to wear a scarf all the time but need some protection from the cold drafts. 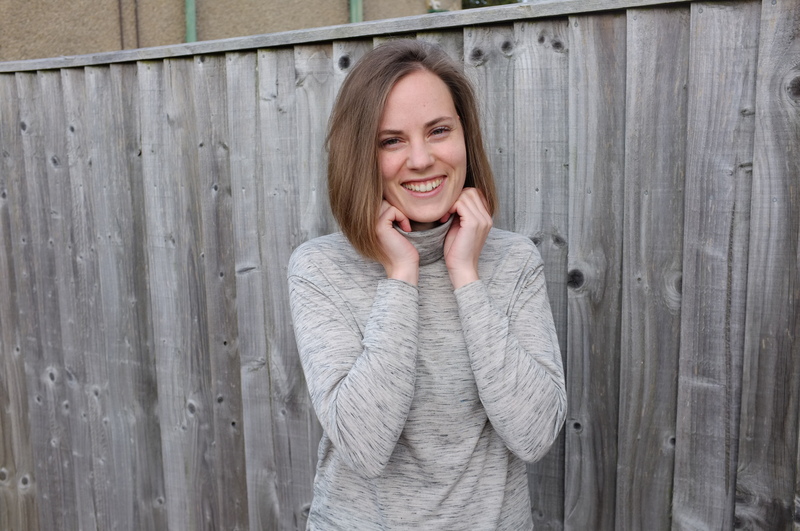 And here a picture of me attempting the obligatory turtleneck modelling pose, which looks more like I have to protect myself from being strangled by my own shirt. I clearly need to work on my modelling skills! 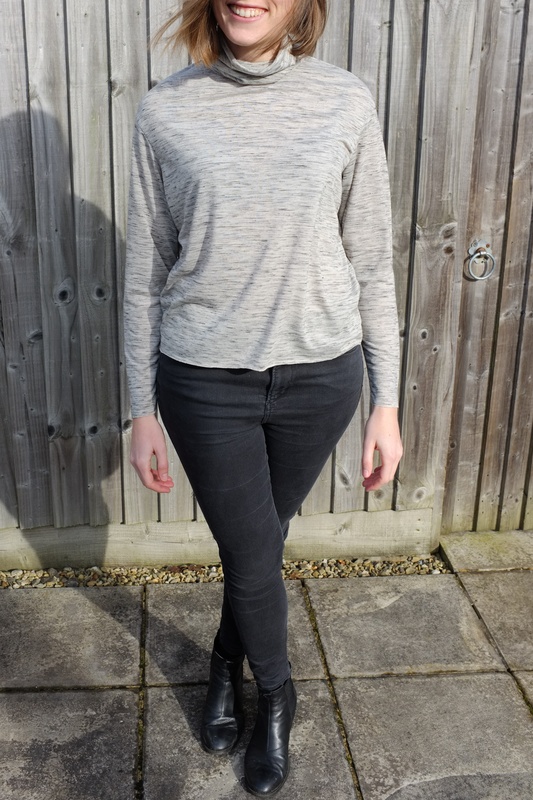 The second garment is a simple longsleeve which I made by copying the ready-to-wear version I have already. The construction was simple on my overlock. 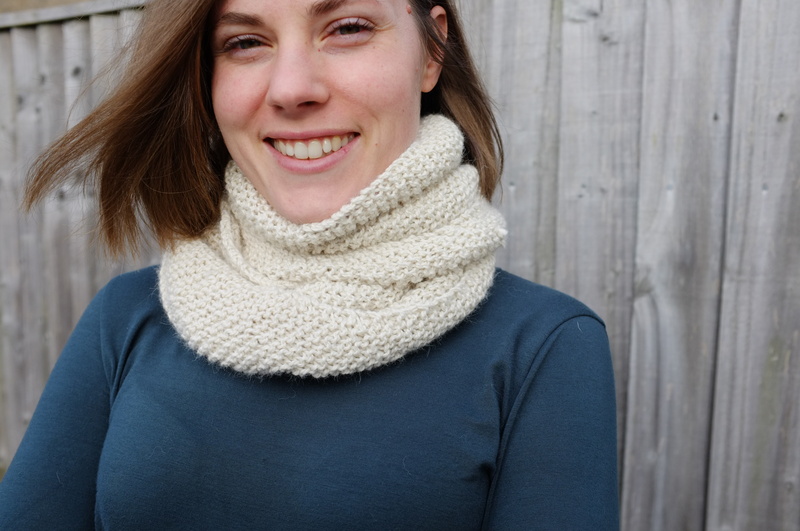 I added a narrow neckband and finished off the hems with a three-step-zigzag stitch. While it might not be the most exciting piece that I own, I’ve been wearing it a lot since I finished it (I am actually wearing it right now) and I am sure it will become a wardrobe staple. And here paired it with my new scarf that I got through the 2016 Secret Valentine’s Exchange, a perfect match!